Lock in a great price for Kalestesia Suites – rated 9.3 by recent guests! Everything was absolutely perfect! 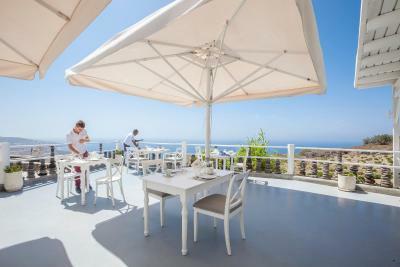 The staff was incredible, the breakfast delicious and the views unforgettable. We got the villa with the jacuzzi on the rooftop and it was so worth it. I can’t say enough nice things about the staff at Kalestesia. They were attentive, accommodating and very gracious. Fira, Oia and Perissa were an easy drive away from Kalestesia. Everyone at Kalestesia helped make our trip to Santorini one to remember. Highly recommend Kalestesia! Everything was fantastic!!!!! We were so well cared for and we slept in every day. Even the children slept in. Super comfortable. I hope we can go again in the near future. The hotel is at the top of the hill, and has some amazing views all around. 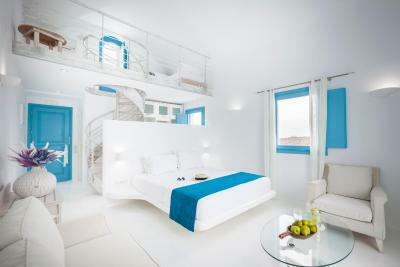 Our room was gorgeous, super comfy bed, jacuzzi with a view of the caldera, and decorated in turquoise and white, super chic. We were welcomed with ice cream and big smiles, and got help with renting a car which was taken directly to the hotel for us. We also got a map and directions to the best places on the island. The food was amazing, our compliments to the amazing chef! If you stay here, do try to have dinner in the restaurant as often as possible, I promise it will be worth it! We definitely recommend this gem of a hotel, and we would love to come back sometime! What a wonderful welcome when we arrived. All of the staff where there to help and so friendly. They shared with us where to go, we rented a quad and they had it arrive at the hotel. Made us feel at home. The view is breathtaking. I will be back! AH-MAZING. 11 out of 10 stars! First and foremost, we loved all the staff there. Incredibly helpful and kind. We arrived way ahead of schedule due to flight changes and were greeted warmly. They rushed our room to get finished and treated us to an ice cream in the meantime. Then gave us a great welcome tour that included lots of good info about the island. The pool was a really nice salt water pool. The breakfast... oh where to begin.... we got completely spoiled. So so so much good food. We had the time of our lives. The team was great about helping us with taxis. Plus we were SOOO grateful for the fact we stayed in Akrotiri instead of the typical spots. Better sunset views that in Oia with no crowds. Truly the best of the best. Awesome hotel with stunning view, very nice and quiet location and super friendly and helpful staff ! Will definitely recommend this place to friends and would definitely stay there again! Amazing staff, helpful and friendly. Make you feel at home and get out of their way to make sure you are having a good time. The hotel has a beautiful view. Great breakfast (you choose what you want and it gets prepared freshly, no buffet!) and very good restaurant service for lunch and dinner. Great place to relax. This place is amazing!!! From the host to the view to the pool to the food!! I can't say enough good things about this place!! The staff was truly amazing!! The host , the waiter, the chef, the cleaning crew, went above and beyond any place I have ever stayed!! 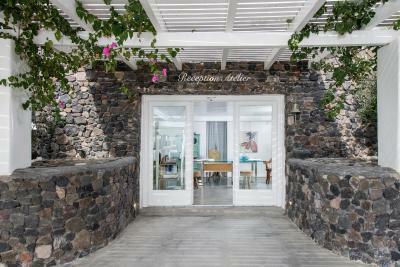 If you are thinking of staying in Santorini , this is place! They even have spa facilities for the guests. The breakfast that is included is giant and super yummy! 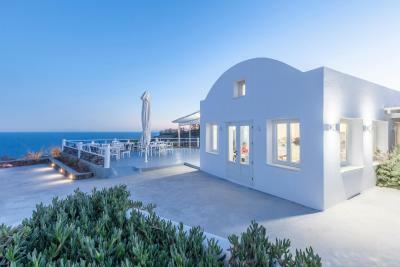 One of our top picks in Akrotiri.Boasting a unique location atop of Akrotiri Hill, Kalestesia Suites overlook the volcano, the Caldera and almost the whole of Santorini. 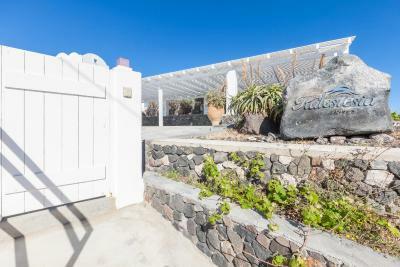 Features include 2 swimming pools, one for children, overlooking the volcano with loungers and outdoor showers. The individually decorated suites have stunning Caldera views. They each have a bathroom with ventilation windows and olive-oil toiletries, and living room with HD flat-screen TV and air conditioning. 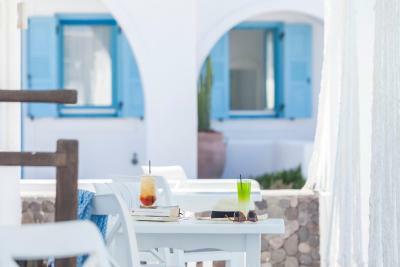 A freshly prepared Mediterranean breakfast with natural organic products is served each morning. 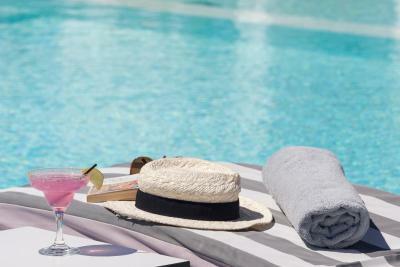 Welcome champagne is offered upon arrival, and snacks and drinks can be enjoyed daily at the pool bar. Conveniences include free Wi-Fi, spacious free parking and port and airport transfer upon request and at extra charge. 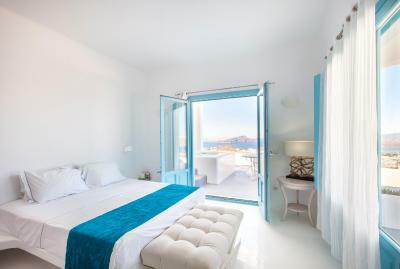 Kalestesia Suites are only 1,150 feet from Akrotiri village and 2,650 feet from its main square. Within a 6.2 miles distance, you will find Fira, the airport and the port, as well as the beaches of Kamari, Perissa and Perivolos. Staff are readily available to assist you with car rental, private excursions for wine tasting or diving, boat trips and will be happy to recommend things to see and do on the island. When would you like to stay at Kalestesia Suites? 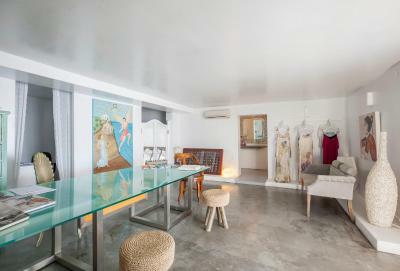 Spacious suite with elegant decor and private patio or balcony with Caldera view. 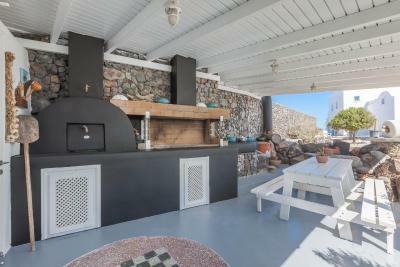 Features include a bathroom with olive-oil toiletries, open-space kitchen and living room and HD TV. Please note that some of the suites have a loft. Enjoying panoramic view of the Caldera, this suite consists of an open-plan kitchen and an air-conditioned living room with an HD, flat-screen TV. The private bathroom is fitted with ventilation windows and olive oil amenities. Please note that this room type cannot accommodate an extra bed. Please note that some of the suites have a loft. Enjoying panoramic view of the Caldera,this suite includes a Jacuzzi and a bathroom with ventilation windows and olive-oil toiletries. This double room includes a a bathroom with ventilation windows and olive-oil toiletries. Guests are offered fruits and a bottle of wine upon arrival. House Rules Kalestesia Suites takes special requests – add in the next step! Kalestesia Suites accepts these cards and reserves the right to temporarily hold an amount prior to arrival. Please note that the reception operates from 08:00 until 23:00. Guests who are expected to arrive outside reception hours are kindly requested to contact the property in advance. Contact details can be found at the booking confirmation. Please inform Kalestesia Suites of your expected arrival time in advance. You can use the Special Requests box when booking, or contact the property directly using the contact details in your confirmation. When my wife spoke to the Hotel staff After booking that does the room I booked have a small kitchen as well where we can heat up the packed food they said YES, but nothing was there in my room. Mike. The property manager was excellent!! We were there mid october at it wasvery quite, only 3 rooms occuped. The place is very nice with amazing view on the Calderia, and on the other side of the island for the breakfast. Everybody is very friendly and helpfull. You need a car to go there, but in any case you need one if you want to enjoy the island. There is stray cat problem on Santorini. Problem is going to be smaller if Santorini people start sterilise cats and organise feeding stations and water also during starving winter. 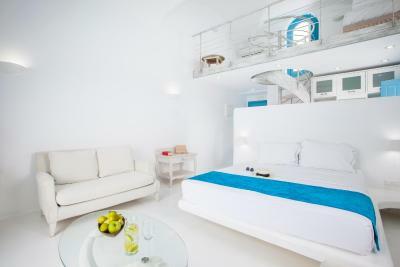 This is just a suggestion for this and other Santorini hotels. Stuff of this hotel is otherwise very nice to people and animals. All people that work here are extremely good. Very nice, efficient and friendly. The hotel is super. The view is fantastic. The rooms are great. Super food. Super fun room for kids. Everything was 10+. Can not wait to come back. Such beautiful views and so quiet! Our room was incredible. Clean, comfortable and sitting in the hot tub overlooking the Caldera is breathtaking. Meni and Thanos were the best hosts. So knowledgeable and helpful, there wasn’t anything they wouldn’t do to make us happy and to help. The food is delicious... so fresh and beautifully cooked! It feels like a home away from home and we were sad to leave. We very much hope to be back. Amazing location, jacuzzi on the roof, spacious suite, friendly staff - when we arrived we were given recommendations for the sightseeing which were very helpful. - big and tasty breakfast. Only one thing that could have improved the stay which would have been a heated pool. The amazing views, staff were lovely and always had a smile on their face very friendly. Location, staff, the room, the view! The perfect place for a nice holliday. Excellent location outsiside of the crowd. Small and fine facility. Always extrem clean and in good order. Comfortable appartements, wonderful view. The stuff is kind and friendly, you always feel like at home. Good kitchen for both breakfast and dinner. We really loved it. The hot tub was an added bonus but it only worked one night out of two, that was a real bummer. It was hard to find the hotel the first time and following GPS in a car didn't really help if you're not familiar with the area. Amazing and very friendly staff. Very good breakfast!